Diego de Landa’s Relación de las cosas de Yucatán does not exist! Fray Diego de Landa Calderón (1524-1579) was a Franciscan priest born in Alcarreña de Cifuentes, Guadalajara, Spain, who traveled to Yucatan and became the asistente del guardián of Izamal in 1549. In 1552, he was promoted to guardián and in 1561 promoted again to provincial of the province of Yucatan. The following year, de Landa initiated an auto de fé in Maní, Yucatan, in which he famously gathered and burned all the Mayan codices he could get his hands on at the time. The Mayas who were rounded up during the search for evidence that would incriminate them of the crime of continuing to secretly worship the old gods were all severally punished and tortured unmercifully. Many were killed out-right, died during the torture, or committed suicide. When the bishop of Yucatan, Francisco de Toral, heard of these proceedings, he complained about De Landa in a letter to the Spanish king, Felipe II. De Landa, in turn, traveled to Spain in 1563 to defend himself of the bishop’s accusations, which he did successfully and was subsequently acquitted of any wrongdoing. The torture was done in the name of God, after all. While he was in Spain, De Landa wrote a document outlining his understanding and observations of the Mayan culture. He may have planned on using it in his defense, or he may have planned on publishing it, but he ended up doing neither. By 1566, De Landa stopped work on the manuscript. The King had recently issued a decree forbidding the publication of books about superstitions and the manner in which the Indians of the New World lived, so that was that. During his stay in Spain, Fray Diego de Landa’s old antagonist, Bishop Francisco de Toral, died and De Landa found himself appointed as the new bishop of Yucatan in 1571. He carried the manuscript with him back to Yucatan in 1572 and deposited the manuscript in the Franciscan convent in Mérida, Yucatán, for safe keeping, but at some later point the document disappeared. The last mention of the original manuscript was in the Relación de Chunchuchu y Tabi by Pedro García in January 20, 1581. Although De Landa’s original manuscript was lost and never published, a scribe’s abridged copy of a portion of the original manuscript was discovered in 1862, in the Academia de la Historia, in the Royal Library of Madrid, by Abbé Charles-Étienne Brasseur de Bourbourg. This fragment represents an unknown percentage of the original manuscript. It was copied down in 1616 on 66 two-sided leaves plus a map and is the work of three different scribes. Sometime later, the 66 leaves and map were gathered together out of sequence and bound together by a bookbinder. It was entitled Relación ele las cosas de Yucatan, sacada de lo que escribió el Padre Frai Diego de Landa de la orden de San Francisco. In 1864, Brasseur de Bourbourg transcribed a portion of the Spanish text of the fragment of the copy of De Landa’s manuscript, adding titles and rearranging the order. He then added a French translation to it, which he had Arthus Bertrand publish in Paris as Relation des choses de Yucatán de Diego de Landa. 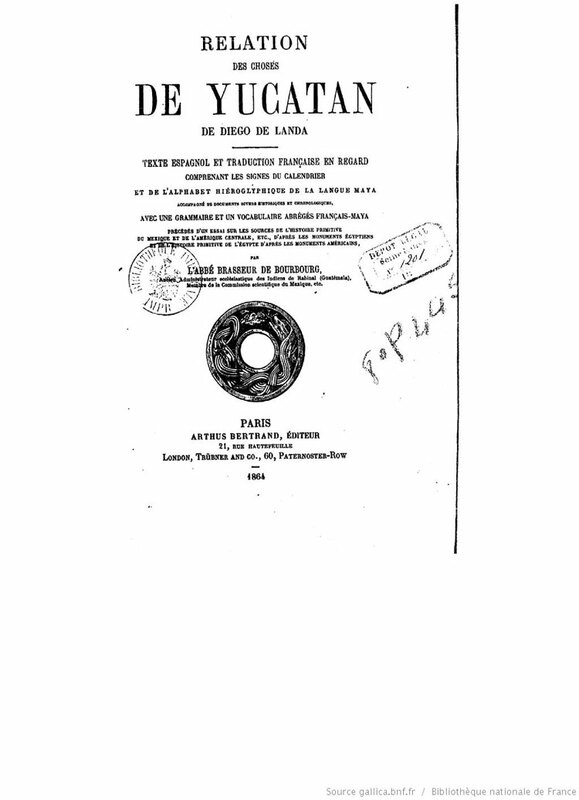 The front piece of the first edition of Relation des choses de Yucatán de Diego de Landa. Since 1864, portions of the fragment of the abstract have been published 14 more times, but few editions include all the text, or all the drawings. For example, William Gates published his version of the abstract in English in 1937, but without many of the original drawings and with the inclusion of many more drawings and notes that were not originally contained in the scribes’ abstract. This work was reprinted in 1978 by Dover Publications. In 1983, Ediciones Dante reprinted the 1938 version by Pérez Martínez, but this Dante version also lacks many of the abstract’s drawings and the pages have been re-shuffled. The result of all this loss, redaction, copying and reshuffling is that the published versions of the texts that most people have come to believe are faithfully typeset copies of the original Diego de Landa manuscript are nothing of the sort. They are simply copied snippets of copied snippets, rearranged in various orders. 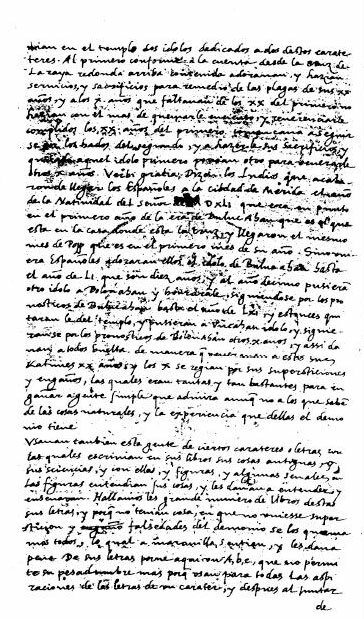 The original Diego de Landa manuscript, as far as we know, no longer exists.